A part of moving is decluttering. 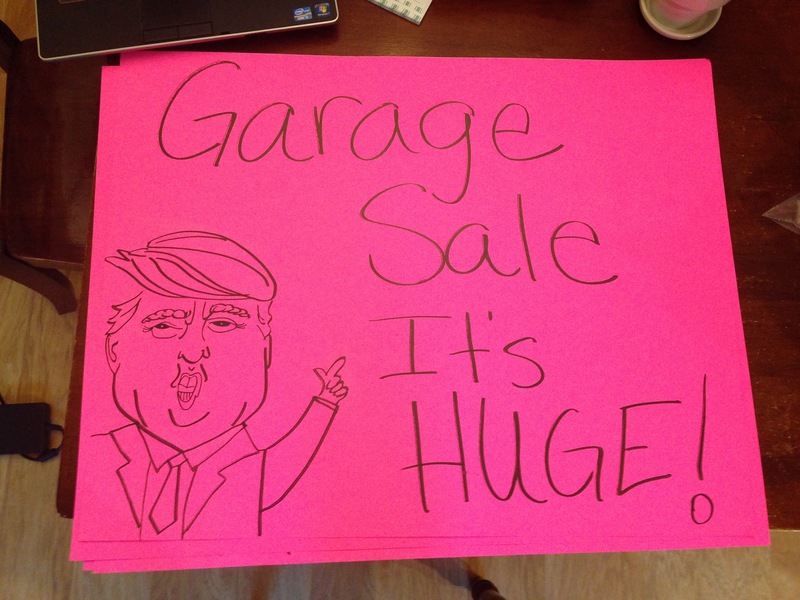 Part of decluttering is hosting a garage sale! 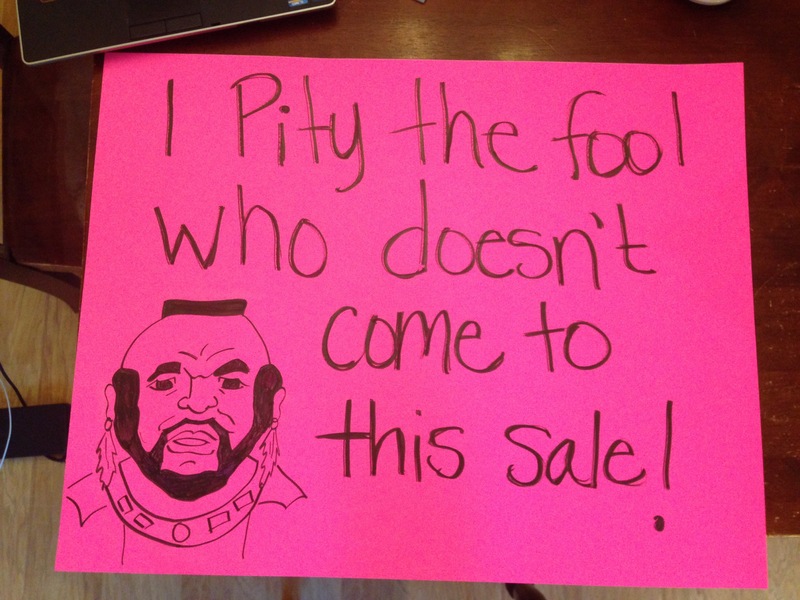 I enjoy garage sales. They can be slightly overwhelming but worth it when you get cash for clutter. I can recall my mom having lots of sales growing up maybe that’s where I get my affection for them from. When I decided to have a sale I did a little pineresting and found some good ideas about how much change to have on hand, how to organize your items, and sign ideas. I dedicated about 2 hours one evening to signs. I love drawing and this was a great opportunity to get the kids in bed and have some fun me time. 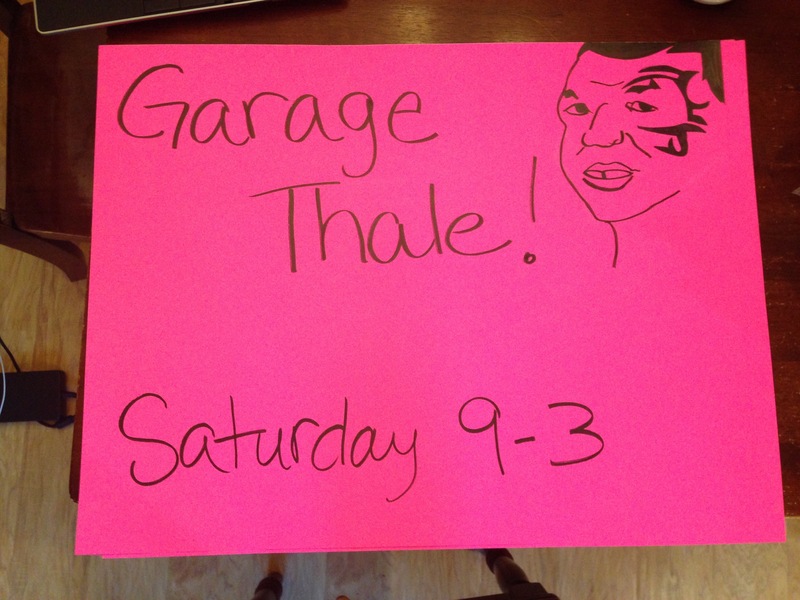 90% of the people who came to my garage sale commented on the marketing. I had to stop by and meet the person who made those signs! Your signs are the best! The variety of popular pop culture icons brought in a very diverse crowd. Not just the typical garage sale shoppers. It also attracted a couple critics. My sister posted on a couple local FB sale sites and one person commented with an angry emoji. Huh?? (Side note- this is an example of why I’m happy to no longer be on FB) When questioned by another random person the poster responded that “We are all tired of her. It’s as bad as YOLO” Uhhh who is we? 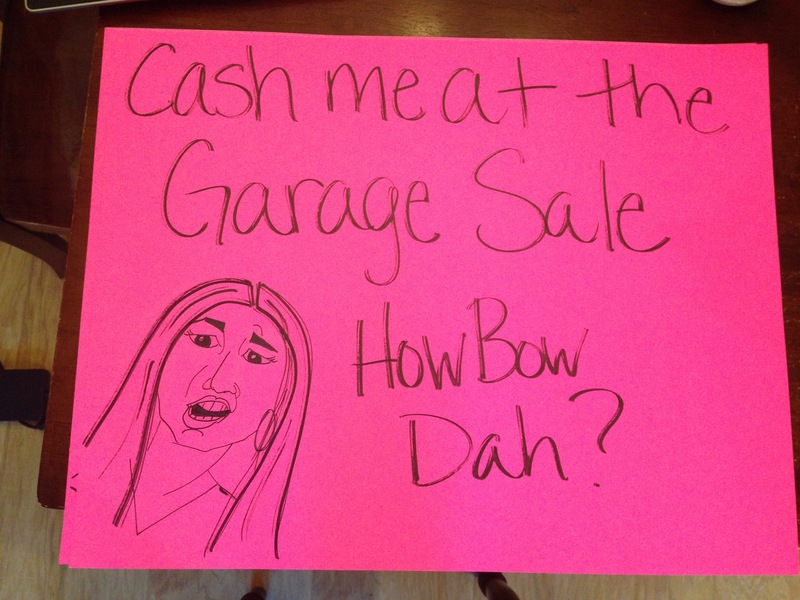 You speak for the masses of garage sale sign haters? Well we didn’t respond because my address was posted and there are some crazies out there. True to crazy, that guy must have sent out a bat call and one of his cronies tore my sign down 😕 My feelers were slightly hurt. I spent time on that and good grief it’s a sign! Ultimately I dismissed it and decided I’m grateful to be off FB and grateful my life isn’t so out of control I get spun up about garage sale signs. Fun weekend overall hanging out with my sister, making a few bucks and getting rid of some clutter. The hard part is now dividing the remaining items into donate, Craigslist and dump piles then actually getting these piles out of the house and not back into the crawl space. Best part of the weekend goes to the full price offer we got on the house!!! Congrats! That’s a relief to get the house sold. Hope your move goes smooth!